Moravia is one of three historical territories of the Czech Republic. It lies between Bohemia and Slovakia in the Morava river valley. A cycling route leading to this river valley "Moravska stezka" joins numerous historical cities, palaces, wine towns and beautiful gardens. 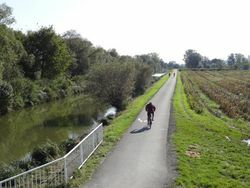 The route goes through age old riparian forests, past picturesque fish ponds and small ship canals. Traffic routing and signposts along this route are excellent. Moravia, with its bounty of attractions, can easily compare with well known European travel regions. It is hard to believe that up until now affordable cycling offers were missing. We have now stepped in to fill the void! From Krakow onwards it doesn't take long to get to the Morava valley at Olomouc over the recently completed highway. You can start your cycling holiday here with good beer, wine, style and quality! Day 1 (Saturday) Arrival and registration at the lodgings. Arrival in Krakow, first overnight stay at a hotel in the historic city center. Additional nights can of course be booked for those wanting a closer look at Poland?s erstwhile capital. The trip can also be booked subsequent to our popular weeklong travel packages (e.g. 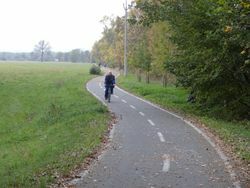 Dunajec cycle path). Arrival in Katowice (where there is also an airport with many affordable direct flights). First overnight stay in Katowice. The trip can also be started in Vienna, for example subsequent to the classical Danube cycle path tour. In this case the first night is booked in Vienna. Our minibus departs from Krakow at about 8:30 am. Further guests can join us in Katowice around 10:00 am. In case you stayed overnight in Vienna, you can come to Olomouc by train (about a 3 hour journey, one change of trains) or by bus (2,5 hour journey, direct connection) and we will pick you up from the train station. 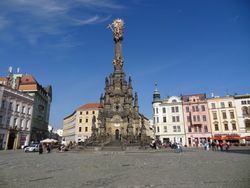 We will pick up guests who stayed the night in Olomouc from their hotel. At about 1:00 pm at the latest, we arrive in Litovel. It is a small town with a well known brewery. The Morava divides in to several channels here, and they flow around the old city center. We begin the cycle tour after lunch at an old mill. The short first stage passes through a reserve with a protected riparian forest. We soon see the historic constructions of Olomouc, the erstwhile capital of Moravia. This historic town which has been included in the UNESCO World Heritage list is the second most important protected monument of the Czech Republic. Olomouc has a great deal to offer. Leave yourself enough time to visit the Holy Trinity Column at the market place, the town hall with an astronomical clock, Saint Wenceslas Cathedral, the Olomouc fortress as well as a grandiose Archbishop?s palace. Cycling past the walls of the fortress is an awe-inspiring experience. We next cycle along the Morava to Tovacov, an architectonic jewel set between the fish ponds. It has a palace and a Jewish museum. The small town of Chropyne boasts a Renaissance hunting lodge. This stage ends in beautiful Kromeriz, a small city commonly known as the Athens of Moravia. Kromeriz has a picturesque historical city center, community centers, arcades and a magnificent archbishop's palace. It is best known for its two superb parks. For the most part, today's stage today is a flat cycle route along the Bat'a canal. It is a fascinating technical monument and the Czech version of the French 'Canal du Midi'. This navigable canal was originally built for transporting lignite and came into disuse over the course of time. 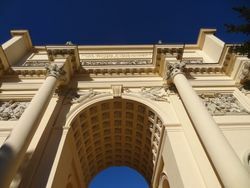 It has now been restored as a tourist attraction. 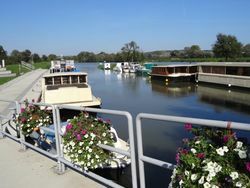 You cycle past old locks, tourist ships, houseboats and cafés. Those interested in architecture can take a detour to Zlin, the headquarters of the legendary Bata shoe firm. This stage ends in Uherske Hradiste - a historic town that was originally founded on an island of the Morava. There is also a lovely historic center with a large market square. Amongst the historic monuments particularly worth a visit is a neo-Romanesque synagogue. You cycle through Moravian Slovakia, where the special folklore tradition is still alive. The region is known for its little white houses with blue shutters, wood carvings and ceramics. Vineyards, meadows in bloom, palaces and folk architecture can be enjoyed together with a glass of excellent wine on site. In Uhersky Ostro you can visit the historical city center, in Straznice the palace gardens and in Petrov the alley of cellars. An overnight stay is planned in Hodonin. Today you take leave of the Morava river valley and cycle through scenic vineyards to Breclav, a town on the banks of the Thaya. You will be following the course of the river upstream. Again we cycle through protected wild riparian forests towards Lednice. There is a fairy-tale neo-Gothic palace here and beautiful gardens that were once a meeting place for European aristocrats. One is surrounded by the cultivated landscape of Lednice-Valtice, also called the "Garden of Europe" for its beauty. You then cycle through parks past numerous decorative structures such as a minaret, colonnade and triumphal arch. We stay overnight in Valtice, directly next to the second palace which was once the magnificent seat of the rulers of Liechtenstein. Not only do you immerse yourself in Moravian culture you can also indulge in some excellent Moravian wine in the wine saloon. The last stage runs through Mikulov. A Baroque castle dominates this town and welcomes cyclists from a distance due to its location on high cliffs. The historic town center surrounding the market square has ornate houses and an imposing tomb of the aristocratic family of Dietrichstein. Then again there is some easy cycling on a flat cycle route. Directly behind the Austrian border you arrive at the last lodging in Laa an der Thaya. Try out the thermal springs there! Return journey is to Olomouc, Katowice and Krakow with our minibus or by train (your own return journey). A direct train connection is about an hour and half. 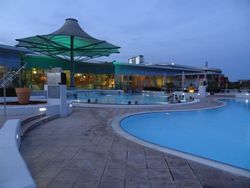 It is also possible to spend further nights in Laa. The surroundings offer many possibilities for round trips. 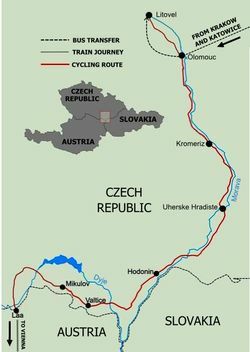 There is, for example, a 50 km long "Natural Jewels Cycle Route" in the Czech Republic and the northern wine region. Almost the entire trip is on flat cycling routes. Some wine hills at Hodonin and Valtice as well as Mikulov town center which is also located on a hill. Up to 70% of the roads are paved and the other 30% are gravel roads. Not included in the price: Travel to Krakow, train ticket Laa - Vienna, entry fees, private payments such as other meals, drinks and tips.